I’ve been in withdrawals over the last year. Since we moved to New York, all of our things have been in storage while we build our house, including my collection of old windows. I haven’t ad a chance to go looking for more, so when a friend very kindly gave me a few of hers, I knew exactly what I wanted to do with one of them. 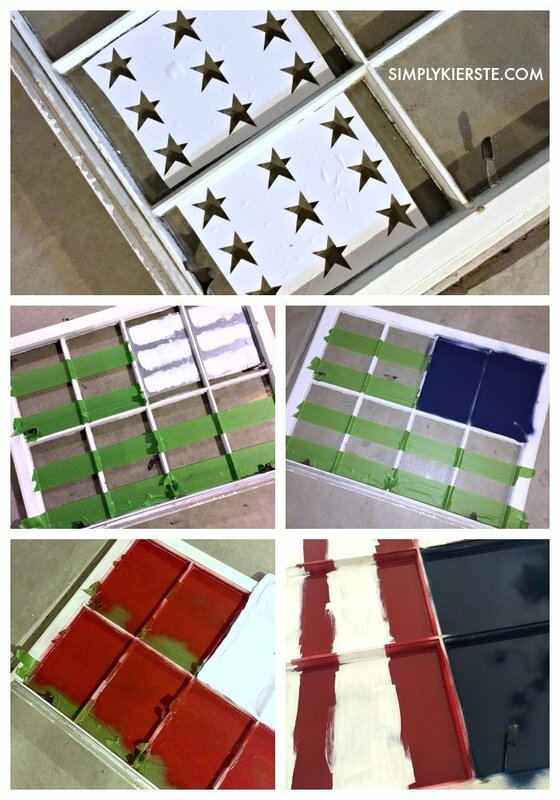 Making a painted flag window has been on my list forever, and I want to use it not only for holiday decor, but on a regular basis in my home. Not sure where yet…but somewhere! It was super easy to do, and I LOVE it! I’m already trying to figure out where I’m going to permanently put it in our house, but for now, it will be perfect for my patriotic decor throughout the summer. You can put it on a front porch, mantel, entry table, wall, sturdy shelf, or over an entry table, and in a kitchen, bathroom, bedroom, playroom…anywhere! It’s an easy 1-2 day project, with most of it being drying time for the different colors and layers of paint. There are different ways of painting these flags, but I have my own way doing it–I try to make it as easy and foolproof as possible! I also wasn’t going for perfection, because it lends so much charm to a piece like this. The stripes aren’t perfectly the same size, and not all the paint is the same thickness, but I love it like that. 1. You can really use any old window that you like. I decided on one with 8 panes, and it was actually super easy to tape off and paint, because of all the different sections. You can use a window with no panes at all, or perhaps two panes–whatever you can find or like you can make work. Clean the glass really well on both sides, but especially the side that you’ll be painting. You will be painting on the back side of the window. Sand all the edges and wood of the window, making sure to get any paint chips off. Wipe off all of the excess dust. My window was already white, so I didn’t need to paint it, but if yours isn’t, you may want to tape off the glass and paint it before starting. 2. Once your window is prepped and ready to go, lay your window down with the back side up–this is the side you’ll be painting. Tape off the section you want for the blue paint and stars–whatever size you like based on your window. This is where the 8 panes was super easy for me–I didn’t have to do any taping for this part! Once it’s taped off, apply your star stencil. I cut one out on my Silhouette, and created a design that would fit exactly in my space. Then I used the negative space and placed it right inside the panes-two of them. If you don’t have a Silhouette, no worries–just use any star stencil. If you just have one, you’ll need to apply it over and over again, for as many stars as you like, but it will definitely still work! MAKE SURE you put the stars in the right place! Since you’re painting on the back side, when you flip it over, the stars will be on the opposite side. Apply them on the top right, so they’ll be on the top left when you turn it over. I used a combination of craft paint and spray paint, but for the stars I used craft paint (Wedding Cake, Martha Stewart). I applied it with a foam brush over the stencils, and then let dry completely. Remove stencils. 3. While the stars were drying, I used painters tape to tape off the stripes. Since I had separate panes, I could do all of my taping at the very beginning, and didn’t have to wait for the blue/stars to dry first. If you don’t have separate panes, you’ll need to tape off for the blue/stars first, and wait until later for the stripes. Once the stars are dry, you’re ready to apply your blue paint. I decided to use spray paint for this part, because I didn’t want to risk ruining the stars, and I didn’t want to have to apply a million thin coats. You can absolutely go the craft paint route if you want to, just be really careful when applying it over the stars. I covered up the rest of the window first, then sprayed Rustoleum navy blue paint right over the stars and then let dry completely. 4. If you don’t have separate panes, you’re now ready to start taping for the stripes You’ll need to place tape over part of the blue, right on the very edge of the top and bottom, but be careful–press it down enough to get a seal, but not too firm–you don’t want the blue paint or stars coming off when you remove the tape later. I wanted thicker stripes, so I doubled up on my strips of tape and overlapped them to get the width that I wanted–and so that it would fit in my space. You’ll need to figure this out based on the size of your window, and if you want your stripes thicker or thinner. P.S. Red stripe is at the top! You’re going to be painting red first, so leave it open at the top. 5. When the tape is set, you’re ready to paint the red! Again, I used spray paint for this part. You can definitely use craft paint if you like (my favorite is Tompte Red by Delta), just factor in a little more drying time, since you’ll need to do several coats. If you’re using spray paint, make sure to cover up the blue section. It won’t be the end of the world if you get a little red paint on the blue, since it won’t be against the glass and show up red on the other side, but I like to play it safe–especially using spray paint. 6. Once the red stripes are totally dry, remove the painters tape and you’re ready to add the white stripes. This is where I used craft paint, because it would be nearly impossible to line up tape on the red stripes exactly right. You can totally try if you want to, but I don’t think you have to. I used a foam brush and applied the white paint to the open glass areas where the painters tape used to be. Try not to go over into the red, but again, it won’t be terrible if you do. If your red paint is thick enough, the white won’t show through anyway. Once dry, repeat coats as necessary. And ta-da! You have an adorable painted flag window! 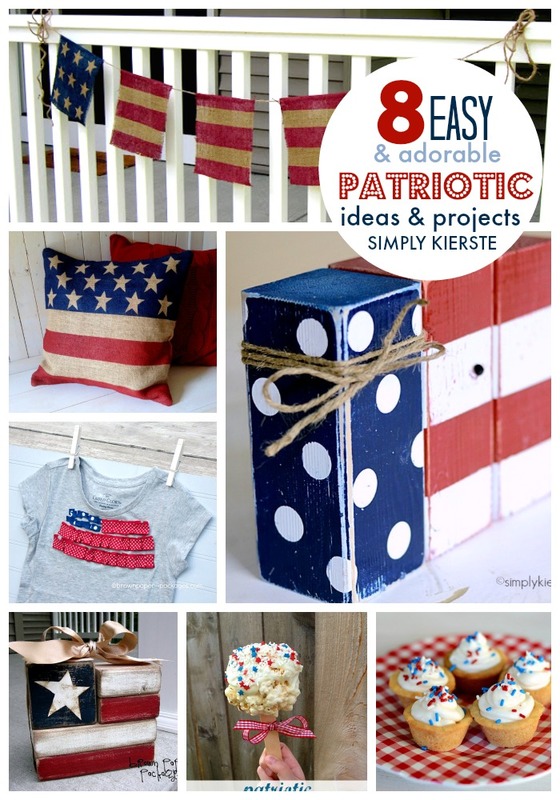 Here are even more of my favorite patriotic projects! What do you recommend using if your window is not white? Spray paint or the same white you used for the stars?